Form or join a syndicate of criminals that share common goals. Being in a syndicate will allow you and your fellow criminals exclusive access to events, rewards, challenges, gear bonuses, syndicate chat, and more! Creating a syndicate will become accessible when the cost and level requirement are achieved. Select a starting element bonus that provides your syndicate members an initial bonus when they equip gear with that element. Additional element bonuses can be added and upgraded later. Create a syndicate emblem that will represent your syndicate. Being in a syndicate can gives you a variety of in-game benefits. However, finding the right syndicate that fits your personality and play style will take a little research. Tap "Syndicate" on the main screen, then choose "Join Syndicate" to check available syndicates. Choose to search for a syndicate by name or element. You might get an invitation from a syndicate, which you can accept to join. Additionally, you can view the profile of another player and remission to join the syndicate they are in. All syndicate members are allowed to invite other criminals to join the syndicate. Anyone can remission to join, but only a member in a leadership role can accept the remission. No one can remission to join and ONLY syndicate members in leadership roles are allowed to invite other criminals to join the syndicate. No one can remission to join AND syndicate members are not allowed to invite other criminals to join the syndicate. This is NOT recommended when your syndicate is very low on members. Now that you're in a syndicate, you'll notice that syndicate challenges track individual player activities such as completing missions, collecting cash, defeating world map enemies, etc. Each time one of these challenges is completed, the syndicate will earn Syndicate XP, and level up the syndicate when the XP gauge is filled. All challenge and level progress can be viewed from the My Syndicate - Main screen. Gaining syndicate levels will increase your syndicate capacity to allow for more members and promotions within your syndicate. Add to your Syndicate Bank by contributing cash! Syndicate members in leadership roles can use the Syndicate Bank to purchase element bonuses and Guardians for the entire syndicate. Contribute to your syndicate to prepare for the next Syndicate War! Gain additional element bonuses for all syndicate members through Syndicate Bank purchases. Element bonuses provide syndicate members an ATK/DEF bonus when gear of that element is equipped, and that bonus works everywhere in the game. Increase your syndicate's starting element bonus, or purchase new element bonuses to power up the gear of all of your criminals! Earn rewards for being generous! Receive exclusive Enhance Boost Gear for contributing to your Syndicate Bank. The more you contribute, the more gear sets you'll earn! All syndicate members in leadership roles receive an ATK and DEF boost called a "Syndicate Leadership Effect"! This boost is added everywhere in the game (fighting world map enemies, Epic Bosses, other criminals in PVP, etc). Now that you've formed a syndicate of epic criminals, the moment has come to face off against rival syndicates in battle! 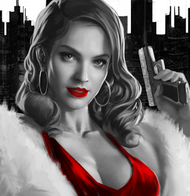 Participation is open to all active criminals in a syndicate when the Syndicate War event begins. While the event is active, many syndicate actions are frozen. This includes syndicate recruitment and enlistment, as well as promotion, demotion, and removal of existing syndicate members, etc. Your Syndicate War gear set will be the same gear that is equipped for the Arena. Battles between syndicates must be initiated and can be done so by tapping the "Declare War" button. Once an opposing syndicate is found, a Syndicate Battle will officially begin and last 60 minutes. Both syndicates in a Syndicate Battle will earn War Points based on their performance. The winning syndicate earns a War Points bonus, and all earned War Points are applied directly to your syndicate's ranking. Collect the most War Points by the end of the Syndicate War to earn massive rewards for your entire syndicate! War Points are earned for every criminal that you defeat during a Syndicate Battle. Additionally, you will earn bonus War Points for winning each fight. Don't be afraid to fight difficult opponents, because every criminal you defeat, even if you lose, counts towards your syndicate's total War Points. Fight hard and fight often, because winning a Syndicate Battle also provides your syndicate a special War Point bonus! During a Syndicate Battle, each syndicate member can earn War Points by defeating rival criminals, and attacking the opposing syndicate's Guardian and Syndicate Gate. You can even earn additional points for defeating syndicate leaders and tougher opponents! Costs a normal amount of War Energy with no bonuses to ATK and DEF. Costs a full bar of War Energy (4) with a huge ATK and DEF bonus. War Energy replenishes at a rate of 1 per 25 minutes and can also be refilled by tapping the War Energy bar at the top left of the Syndicate War menu. Battle Frenzy is a bonus effect that increases the amount of War Points gained for a period of time. Battle Frenzy may be triggered automatically during a single Syndicate Battle when the Battle gets close. All opposing syndicate members start “protected” by their Counselor. This means that all other members are unavailable to fight until the Counselor is defeated, or until the Counselor has been attacked enough times. Your syndicate’s members can still attack the opposing Syndicate Guardian or Syndicate Gate if the Counselor is protecting other members. Counselors start with a 50% DEF boost while protecting their syndicate’s members. The bonus decreases as members lose to the Counselor, and disappears completely if the Counselor is defeated or attacked enough times. Syndicate Guardians act as an extra layer of defense! While a Guardian is alive, the opposing syndicate earns less War Points. Higher level Guardians better protect your syndicate, with higher health, ATK and DEF, AND greater War Point protection. Attacking a Syndicate Guardian yields War Points even if you don't defeat it. When an opposing syndicate's Guardian is defeated, the member of your syndicate who dealt the most damage to the Guardian will earn additional rewards! The higher level the Guardian is, the better your rewards will be, so make sure to give powerful Guardians your best shot! Rewards may not show up immediately, but will be awarded to the victor soon after the Guardian is defeated. If members are having a hard time defeating rival criminals, they can always attack the opposing syndicate's Syndicate Gate. It is always available to attack, but doesn't give out as many points as winning against rival criminals. About 60 minutes before the 3-day Syndicate War event ends, syndicates will not be permitted to Declare War. Accumulated War Points, earned from both wins and losses in Syndicate Battles, will determine your Syndicate's ranking in the Syndicate War Event. Fight hard for better rewards, because all members of your syndicate get all of the rewards shown! The available rewards for a Syndicate War can be viewed from the "Rewards" tab of the Syndicate War menu. Because Syndicate Wars rely on the strength of your entire syndicate, every syndicate member earns all of the rewards shown for their syndicate's final reward tier. Each syndicate member must log in to the game during the Syndicate War's redemption period in order to claim their rewards. Make sure and work as a team, because competition will be fierce to get the highest and most powerful rewards for each Syndicate War! Each Syndicate War has its own leaderboard, which track your syndicate's War Points and ultimately determine your syndicate's final reward at the end of the event. Check back often by tapping the "Leaderboard" tab of the Syndicate War menu.